Top leaders of Vietnam and Belarus have agreed to beef up economic and commercial ties, striving to raise two-way trade to US$1 billion next year. 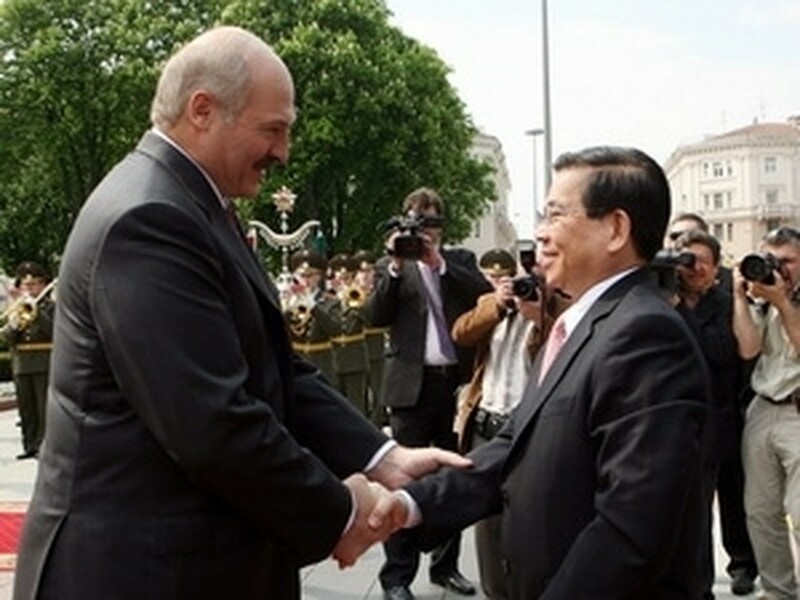 Vietnamese President Nguyen Minh Triet and his Belarusian counterpart, Alexander Lukashenko, reached consensus on the issue during their talks, following an official welcome ceremony held for the Vietnamese leader in the capital city of Minsk on May 13. 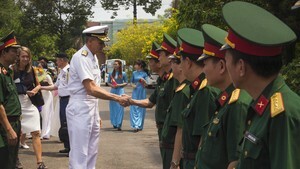 President Triet said, while implementing its foreign policy of independence, self-reliance, diversification, multilateralization and positive and proactive international integration, Vietnam always attaches importance to strengthening and developing its friendship and multifaceted cooperation with traditional friends, including Belarus. President Lukashenko spoke highly of great achievements the Vietnamese people have reaped during the process of renewal and national construction as well as their efforts to improve Vietnam’s prestige in the region and the world at large. The Belarusian leader said he hoped that Vietnam will work as a bridge for Belarus to expand relations with Southeast Asian nations and in return, his country will serve as a gateway for Vietnam to enter Europe. Both host and guest expressed pleasure at fine development of the bilateral relationship over the recent past and agreed upon directions and measures to step up friendly and cooperative ties, especially in economy and trade. The two presidents said economic and trade relations have seen huge progress in recent years, with two-way trade in 2009 recording a four-fold increase over 2005. They agreed to expand cooperation in producing MAZ automobiles, diesel engines, electric generators, pullers and heavy trucks in Vietnam, and boost cooperative ties in other fields, including culture, education-training, oil and gas, agriculture, banking, tourism, health care and labour. The two leaders said they believed that the results and agreements reached during President Triet’s visit will create a new momentum to foster multi-faceted cooperation between the two nations, particularly in economy and trade, in the years to come. Triet and Lukashenko also discussed regional and international issues of mutual concern, noting with pleasure that Vietnam and Belarus have cooperated effectively and supported each other at the United Nations, the Non-Aligned Movement and other international forums. President Triet took this occasion to thank the Belarusian government and people for their huge assistance to overseas Vietnamese who are living and studying in Belarus. He also thanked President Lukashenko for his decision to permit Vietnamese citizens who had previously worked and studied in Belarus during the former Soviet Union duration to enjoy long-term residence in the country. President Lukashenko applauded the Vietnamese community in Belarus and pledged to give more support for them to serve as a bridge for the friendship between the two countries. Following their talks, the two leaders signed a joint statement and witnessed the signing of a number of bilateral cooperation agreements, including an agreement on the protection of secret information and a framework agreement on agricultural cooperation between Vietnam’s Ministry of Agriculture and Rural Development and the Belarusian Ministry of Agriculture and Food. The other inked compacts were a cooperation agreement between Vietnam’s Ministry of Public Security and the Ministry of Emergency Situations of Belarus, an inter-government memorandum of understanding on mutual recognition of each other’s market economy status, an agreement on information sharing and supervision of banking operations between the State Bank of Vietnam and the National Bank of Belarus, and a deal between Vietnam’s Hoa Lac Hi-tech Park and the national Hi-tech Park of Belarus. Earlier on the day, President Triet met with the Vietnamese Embassy’s staff and representatives of the Vietnamese community and students in Belarus.